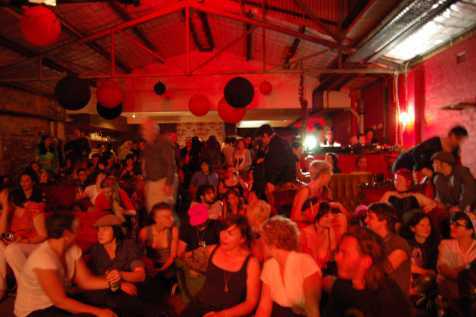 The Red Rattler is the perfect venue for the Now Now festival with its deep velvet antique-esqe armchairs, retro bar and red red red atmosphere. If anything, it may be a tad small given the sizeable crowd that attended the opening of the festival on Wednesday night. Overhead fans had to be turned off due to their noise, but for me it didn’t get too hot despite the oppressive mugginess of Sydney. 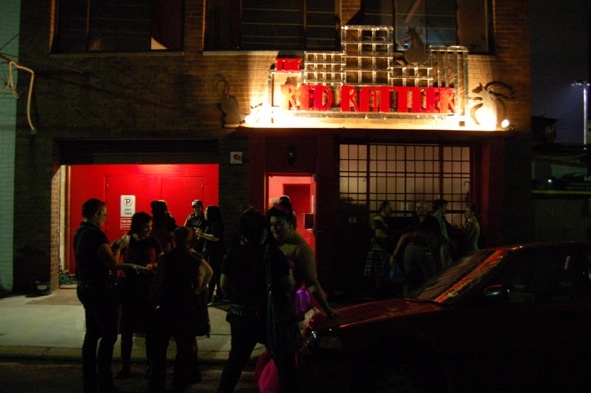 Except that I wandered into the men’s a few time (urinals weren’t enough to give me a heads up – I’m unisexing Sydney one urinal at a time) the Rattler gave perfect atmospherics for music that is not always easy to accommodate. However, our first night was a fairly gently gently does it into the world of experimental music with no break-the-window’s noise barrier chasing or roof-raising shrieks so prevalent in this world, although to be fair I had to leave before I was lucky enough to hear Jon Watts and no doubt that would have brought some of these sounds into the room. The crowd was treated to four sets on the opening night. Each set brought its own special magic, as experimental music does, each unique and persuasive for the collaborative listener. First up was a string trio of Clare Cooper (harp), Anthea Caddy (cello) and Clayton Thomas (double bass) holding a beautiful meditation on the evolving, forever circular presence of silence. The set started with Cooper playing a light trip over the top of a string floor provided by Thomas and Caddy, with occasional tip-taps onto the body of the bass by Thomas. Soon the writhing screech of the cello moves up and over the others so that the harp becomes time-keeper as finger beats on the base ring through the swirl. This early part of the set made me think of rivers and mountains, I’m not sure why, as if I were flying over the top. It’s difficult to retain objectivity with a harp – is such a specific instrument, or usually is. But Cooper’s deft skill and insistence on silence as a base for communication between the sounds brought the harp into its own and away from its history. The sounds of harp and double bass danced particularly well over the top of a writhing didgeridoo (almost) sounding cello from Caddy, who allows the cello at this point slide and slither its way to the fore, the bow sliding up and down the strings with that delicious serpentine zig-zag of a sound the cello does so well. Eventually the double bass moved into a contained frenzy while the persistent drip-drip-drip of the harp behind it acted as a liberating force rather than a tie to the conservative. All of this with the passionate swell of the cello holding silence in its strings as if it could match its sound with the feeling of non-sound. Eventually, when Thomas will use drum sticks and a soft rubber headed mallet on his strings, and all over his bass, particularly the tail piece and all the while the harp will occur underneath like a perverse Greek chorus while Caddy’s cello holds the silence at bay, smooth, resonant and mellowed into the sets completion. The second set was completely different. Joel Stern on footpumps, Anthony Guerra on guitar and Emma Ramsay on drum machine and voice. This was very much a synth dominated set (totally works for me) with a start in a heavy prog style that was right up my alley. I liked the sound immediately, with the guitar working in a delicate backdrop and the sporadic echoes of voice ringing out a doleful single note call. This didn’t last for long with the guitar resonating into its own wilderness backdrop, echoes matching the voice which had moved into a kind of scale climbing and descending. All of this amidst the whirls and crackles of the powerful footpumps and the effect was very evocative. My mind was filled with swirls of images, at once feeling like I was in a scrubby wilderness and then under water and then out in space. Similar to the first set, the presence and absence of silence was overwhelming as if the sounds and silence were clamouring for the space, almost as if there were a fight for survival, a claiming of birthright or a pronouncement of some kind going on between all four sonic presences. The footpumps moved into the kind of sound that can be felt, they ricocheted inside my body. I would have loved to be laying down, allowing he sensuality of sound invasion to move me somewhere else, but one has to be aware of certain behavioural restrictions in polite company. Guerras strings held a rhythmic base, a shifted sands upon which the sonic house of cards from Stern and the lost lonely inhabitant of Ramsay precariously cried in a call for existence. As the sounds built to a swirling crescendo, matched by the pounding of my chest, I’m robbed of my climax as the three faded back into squeaks and anti-ambience, the voice sliding back into a drone. Soon droplets of sound from the footpumps, with the strings ferreting their pervasive burrow only give way to the bang of a cymbal clash. The rise and the fall will continue to tease and taunt as the electronics move into a Fullerton Whitman-esque gurgle that made me think about sound in a retro kind of way while the guitar held me to the ‘real’ as if a ‘real’ were possible. Toward the end I was thinking of a literal reduction then expansion, narrowing then widening of the music. Finally Guerra’s guitar gives way to a slow heart beat, Ramsay’s voice drones down to a shy chorus with the electrics and the electrics mover back toward silence again. Set three was a far more introverted and reclusive affair. Jim Denley with his beautiful balloon sax and the amazing Cor Fuhler with his piano and electronics. Jim plays a sax with a balloon attached to the mouthpiece which produces a syncopated dribble of a sound that works remarkably well in jazz improv. He also practises circular breathing, so his sound – although wind – can compete with string and electrics beautifully, never having to pause for the sound of breath. Co Fuhler I was new to, but I will try to get hold of some of his discs for review after seeing such a strong live show. His electronics are scattered over the strings of the piano gathering all manner of various sound. The duo worked well together, building from a still small space; it felt as though they were actually blowing the space around them larger like a balloon. True to a wind instrument, Jim still retained his breathing sounds, and he also breathes through the sax at times to add a furry kind of sound. As Denley gurgles, warbles and washes through the sax, Fuhler extracts eerie sounds at times, working strongly with silences perfectly timed pauses. The trill of the piano wires worked coherently with the breathy pant through the emotional sax. The audience sat mesmerised as these two talented musicians commanded the space, their presence drawing the listener in as well as their instruments and the sound. The piano is mutant and discordant as the sax makes striking reaches for the night sky, and slinks earth-bound once more so that the piano sounds at times as thought its breathing for the sax. Denley places objects in and out of the sax bell. The sax will evolve and dissolve according to its own prescription while the piano thrives riding a wave of its own reaching, unceasing in a whirlwind swirl. 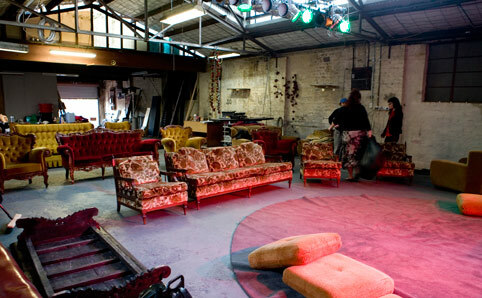 Finally the piano will slide back into a peaceful, exhausted drone and the trembling sax will give way to allow for it. Both instruments and musicians will allow the silence to tumble into the space at the end. As I said above, I missed the final set, but I’ve added a track here by Jon Watts just to give us a taste. But let me say, that was a mighty start to what will surely prove to be a brilliant festival. Tickets to the Now now are still available. Details here.